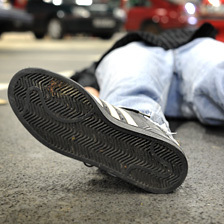 BBC News - Crime scene forensics: How does it work? Forensic evidence and the way it was gathered came under close scrutiny in the trial of Stephen Lawrence's killers. Techniques and practices have developed significantly since 1993 and are now a key part of police investigations from the start. The basic principle is "every contact leaves a trace" and specks of blood, fibres or fingerprints become silent witnesses against the criminal. 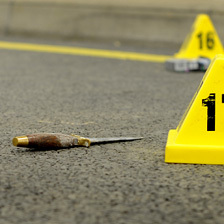 Here, we examine forensic science from crime scene to courtroom. First, explore our 360 degree crime scene to see how the forensics teams get to work. Uniformed officers are usually the first at a crime scene. They are trained to cordon off anything which may potentially be relevant - be it a phone box, a car or a door which an offender may have touched. An outer cordon excludes anyone but police officers. 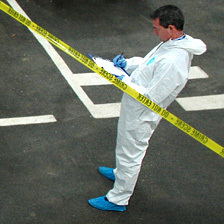 An inner cordon is where the main forensic evidence is expected to be found. A crime scene manager has to try to "stop the clock" to ensure as little is changed as possible. It is his, or her, job to establish the precise area of the scene as well as a "common approach path" to the body or key bits of interest. The officer will also check who has had access, such as police or ambulance crews, in case footprints need eliminating. A common approach path (CAP) is a route set out from the outer perimeter tape of the crime scene to the victim or key area of the crime. 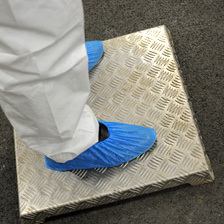 The CAP is often made up of metal stepping stone-style plates which give crime scene investigators access to the scene while minimising contamination of possible evidence. Anyone entering or leaving the crime scene must take this route and their presence is logged. Physical evidence such as a knife, cigarette packet or bullet casings are photographed or sketched in situ. They are logged, packaged and labelled before being sent for forensic examination at the laboratory. 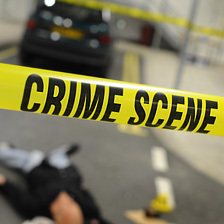 In a murder case, a body may remain in place for several hours before it is removed from the scene to allow all the necessary tests to be carried out. Pathologists may be asked to visit the scene so they can put the body into context when they come to carry out the post-mortem examination. The crime scene and the examples given by forensic scientists throughout this feature are illustrative and not linked to any criminal case or investigation. Special report produced by Emma Lynch, Dominic Bailey and Luke Ward. Feedback: Send us your views on the way this feature is presented.